In filtering for complete phage genomes, it became clear that the phages with the same name will have multiple accession numbers, for multiple reasons. The simplest is the presence of a RefSeq and original accession number. eg Synechococcus phage S-CAM9 RefSeq (NC_031922) and the original (KU686206). So while it has a unique accession it, it is a duplication of an existing genome. So we were counting these phages twice, we can easily remove these from the total. This reduces the total by ~ 2300, leaving ~ 7700 genomes, as seen above. Just how similar phages with the same name are is hard to tell. The genomes of phages from experimental evolution experiments in some instances can be different isolates of the same phage but have identical genomes …. Whereas environmental isolates with the same name phage but different isolate numbers are roughly the same phage species [whatever that is, but lets not go there], which may lack several genes. Well, the number of unique phage genomes in GenBank [not 100% identical] is probably somewhere between ~6200 and 7700. A number of isolates of the same genome have been sequenced multiple times. The number of phages with RefSeq accessions has barely increased in the last 6 months. 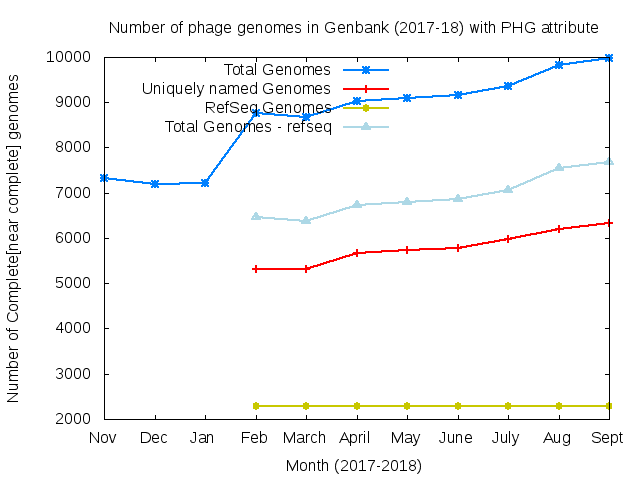 However, the number of “total genomes” and “Uniquely named phages” is increasing month on month. Therefore, using only phage genomes from RefSeq is likely to vastly under-represent the diversity of phages if constructing a phage database.